My mother's grandmother had several dolls at her house when my mother was little. Now the doll has been passed on to me, and I am unsure what the age and value of it is. Can anyone help me? It looks to be wooden, and looks a little rough...but my mother thinks she is at least 100 years old. 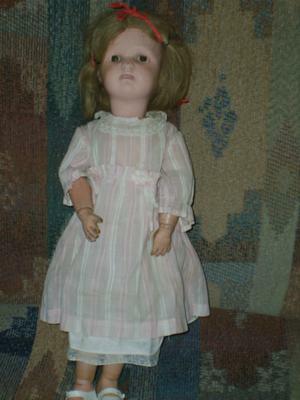 She is a "Miss Dolly" all wooden doll produced by the Albert Schoenhut Company. Her limbs are spring jointed making it possible to for her to be posed in various positions. She's a great doll and the more original you can keep her, the more value she will have (Not to mention sentimental value). Hi; try the Lotz pages for wooden dolls; you can google the key terms. Then, look up the name "Schoenhut," dolls made by Albert Schoenhut in the US in around 1910. Any markings on her neck and/or body? Length? Who is Pipchin? Body looks to be of composition. Is the head porcelain? Eyes open & close or painted on? The more info, the better. Pictures of doll without clothes helps.